We're still building up our forage inventory, and have recently harvested 22 acres of sudex (sorghum-sudangrass). We started Monday of last week by mowing the 10 acre patch across the road from my house. Three straight days of rain showers meant that it took us that long to get all of it baled and silage wrapped, but in the end we were left with 114 bales of "baleage". They will be on the high end of the moisture scale thanks to rain and very little sunshine between mowing and baling, and I'm estimating that they'll average somewhere between 1600-1750 pounds each. We cut an additional 12 acres this week, but the stand wasn't nearly as good. We yielded 68 bales on that acreage, but the moisture level was much closer to the 55% we prefer. You can check out this video from last year to see a bale of sudex being silage wrapped. We've also cut 25 acres of crabgrass this week. That's right, crabgrass can make a pretty good forage! This is a "volunteer" crop that has established in one of our fields over the last few years. We typically plant this acreage in cool-season crops and use it for grazing in late fall and spring, and we opted not to plant sudex on it this summer. We've had some great drying weather this week, and we'll begin baling it tomorrow afternoon. I'm also fertilizing our harvested fields, and I'm doing so with the aid of a demo GPS unit thanks to the Extension Service's Amy Winstead and the Alabama Precision Ag team. I applied 16 loads of dairy slurry ("Water 'n Poo") today on the first sudex field we harvested, and the GPS was a big help in making sure I got full coverage with the right overlap widths. The real test of the system's guidance (or my reliance upon it) was going to be tonight when I intended on spreading in a bermudagrass hay field after dark. Alas, a slow leak on a rear tractor tire progressively got worse this afternoon and forced me to postpone any further fertilization until the tire has been patched. In other news, the weather has been great this week considering it's still August: low humidity, low temperatures in the 60s, and highs only in the low 90s with a nice breeze. The cows are much more comfortable, are eating more, and hopefully will be producing more milk than what they have been lately! Our intentions are to begin harvesting the last of our corn silage next week, and I'll be off the farm Monday and Tuesday attending a conference in Chicago. Have a "dairy" good week, everyone, and don't forget to raise your hand for chocolate milk!!! 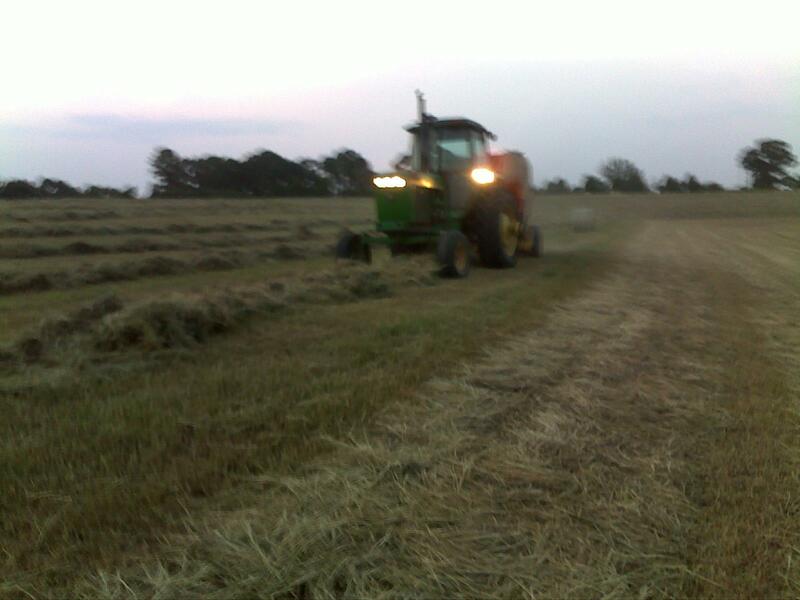 We finished baling our hay early Friday afternoon without any further mechanical or weather issues. We had a light yield this time, thanks mostly to the lack of July rainfall. Taking our superb first cutting into account, though, our hay inventory is about where it usually is in mid-August. We'll get our bermudagrass fertilized soon and will hope to be cutting it again in late-September. Our next little bit of field work will involve harvesting a 10 acre field of sudex as baleage. We'll mow it, "green" bale it the next day, and then silage wrap the bales. Speaking of sudex, we planted this crop in a few grazing paddocks and turned our milking herd into one for the first time this summer. It gets too hot too early for our cows to both graze and eat TMR, and so far we've opted to keep feeding their TMR twice a day. At their current low level of milk production, though, we're going to try to give them a heavier evening feeding and graze them from 5:30-7:30am. We may still see a further drop in production, but grazing may still be a more economical choice with the price of feed increasing lately. Time will tell. Harvesting our "second cutting" of hay isn't exactly working out as planned. Over the weekend, the local extended weather forecast was calling for hot, dry weather, with only about a 20% chance of a passing shower Monday and Tuesday. With that in mind, we figured we could mow, rake, and bale all of the 60 acres that was ready to harvest by the time the week was over. Mowing went by without incident. We finished cutting the bermudagrass on Tuesday, and planned to begin raking and baling mid-morning the next day as soon as the dew dried off. Then the rain clouds came. A little better than a quarter-inch fell Tuesday evening, and I was not feeling too great about our plan. Thankfully though, there wasn't a cloud in the sky Wednesday morning. I started running the hay tedder through the first field we had cut around 11am, and by 1pm the hay had dried out enough to rake and bale. We were 2-3 hours behind due to the previous day's rain, but no big deal. Everything was working great...I had moved into another field with the tedder while one of our employees raked and another quickly rolled up 25 bales. Then our luck started to turn sour. As I finished tedding the second hay field, I noticed that one of the implement's tires was on the verge of blowing out. I called my dad at the milk barn to tell him I could ease it into the next field, but it couldn't make the trip back "home" until the tire was changed. That's when he told me we had bigger issues; namely, a belt had broken on the baler. Dad headed to Columbus to get it repaired, and about three hours later he and I were back in the hayfield. Everything ran smoothly for a while until the dew started falling around sunset. The ground was still a little moist underneath the windrows, and the dew dampened the hay just enough to make us shut down for the evening. This morning we got an early jump on it, sending the rake out at 10am with the baler following a half-hour behind. Once again the job started off good, but an hour into baling we had a minor problem with a sprocket. I took over the baling duties once that problem was fixed, but twenty minutes later a chain jumped off and caused another chain to break. After an hour spent at the shop, the baler was once again ready for action. One bale later, a small chain on the other side of the baler slipped off it's idler sprocket. That would have been easy enough to correct in the field if not for the fact that the idler came apart while getting the chain back in place. Back to the shop! Dad and one of our employees repaired the problem while I went to help our milk hand finish milking duties. The baler was back in the field by the time I finished milking duties, and luckily there have been no mechanical problems since then. We shut down for a while to rest and eat supper, then I raked for a while until dad returned to bale just about sunset. With the ground now dry, the dew shouldn't be much of an issue until later tonight. I'm back home now, and as far as I know dad must not be having much trouble with the baler. We should have 15-20 acres remaining tomorrow if he can bale tonight all of the hay that's already been raked. Barring any major breakdowns or rain (there's a chance tomorrow afternoon), we SHOULD be finished with our "second cutting" by this time tomorrow evening. I'm not going to count my hay bales before they're rolled, though! I posted a new GDF Vocowbulary video to our YouTube channel tonight. This one focuses on TMR, which stands for "Total Mixed Ration". As I mentioned in the video, our cows are currently getting 40 pounds of rye silage daily, half in the morning and half in the afternoon. They are also getting 15 pounds of dairy feed in each TMR batch, bumping their total daily intake up to 70 pounds of TMR. While this is certainly more than you or I would eat in a days time, this is actually a little bit on the light side for our cows. The heat and humidity takes a toll on our cows' appetites during the summer, so they don't eat as much as they do during most other times in the year. As we get into the milder temperatures of mid-Autumn, their consumption will increase and by wintertime they will be eating between 90 and 100 pounds each. 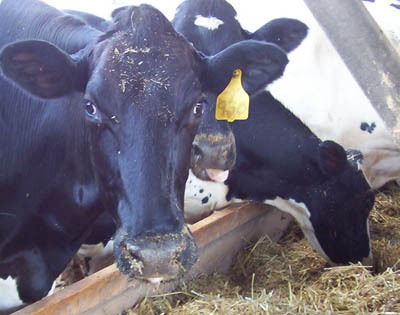 Most of the 20-30 pound increase will be made up of extra forage fed as part of the TMR or grazed. The rye silage and pre-formulated dairy feed will continue to be our main ingredients for a few more weeks. Before long, though, we'll replace the rye silage with two other forage ingredients: rye baleage and corn silage. Between now and next summer, dry bermudagrass hay and sorghum-sudangrass baleage may also make their way into the TMR. It's hot, but we're still farming! As you can see by Accuweather.com's forecast on the left, it's going to be another HOT one here on our dairy farm. Looking at the extended forecast, we're not going to get much of a break, either. We should cool down to the mid-90's (yeah, BIG change) by the end of the week, and right now we have small window in which we might get some rain either Friday or Saturday. Regardless of the terrible heat, dairy farming is a 365 day a year job so we'll be right out there in it doing the best we can. Our cows, fortunately, have been getting enough relief from the fans and sprinklers in our barns to keep from showing too many ill-effects of the heat. Sure, their milk production has dropped, but we have yet to see any health problems we can attribute directly to the heat. We are sending a half-dozen cows to the stockyard this morning (dairy cows provide beef, too!) and should be milking 194 this afternoon. Our corn silage harvest continues and is hopefully nearing completion. We'll be servicing our harvesting equipment first thing this morning before moving it to the final 22-acre field remaining to be cut. A field that size could be harvested in just a few hours with the right equipment, but it'll take our 2-row chopper close to two full days to harvest the terraced, contoured field. Hopefully the old thing will hold together so we can be finish sometime tomorrow afternoon. Once we've finished with the corn we'll jump right into 50+ acres of bermudagrass that's ready to be made into hay. If you would like to see our silage chopper in action, check out our latest MooTube Minute. Try to stay cool, and prayers for rain would be greatly appreciated!